It is important to understand the businesses’ main objective before you begin to write the course material. You will also need to consider the goals of the parties with vested interest (stakeholders). If you cannot clearly define what it is that your course is attempting to do, you will not be able to deem your project a success. A defined mission and method of evaluation will help improve future courses and learning strategies. Define one to three goals the company wants the materials to accomplish. Work with your company to consider exactly what it is that the course should cover. Courses should be very specific and focused in order to promote the best level of retention. Courses that try to cover too many subjects will either become a fire hose of information and difficult to absorb, or they will be to scattered and lengthy for full focus. Be specific in the goals and strategies that will be used for this particular course. Goals should be very clearly defined. Vague goals make it difficult to assess what level of success a learning course had among participants. Be clear in the content you want to present and the expectations you will have once it has been presented. Consider who your learners are and make sure these goals apply to them. Not necessarily every part of a company strategy is going to apply to every employee. Make sure you are considering who your audience is as you pick out what strategies and goals are important for imparting to them. Know the employee you are writing for and make sure the content is going to be relevant to your entire audience and not just a small portion. If there is a specific goal that will only pertain to part of your audience, consider creating an opt-out for those who it won’t apply to or make it a separate course segment. Determine the relevant stakeholders and how course content will benefit or affect them. From board members to administrators, there are going to be many parties to satisfy and cater to. Even though they may not be actually taking the course, they will have an interest in your course, the success rate of training sessions and the message of your materials. Clearly establish a method for evaluating the level of success attained. You need a clear way to mark success. Of course, post-test evaluations will tell you how well learners were able to comprehend materials, but it won’t measure on-site application abilities or retention rates. To get a well-rounded measurement of course success, you will need to have managers on board to define goals and evaluate outcomes. Now that you can see the different learners and how they best absorb information, you will want to consider your ideal modes of instruction. Different styles of learning and presentation materials are important for appealing to more than just one type of learner. You may not have all four learning types in a given group of employees, so it is helpful to define the audience who will be participating in a course. Approach Theorists with structured courses, focusing on step-by-step processes that lead to logical conclusions and providing consideration of different perspectives on the subject. Approach Reflectors with time for discussion, reflection and observation before expecting participation. Approach Pragmatists with value first and foremost, providing clear objectives, practical application and blunt segments (to the point). Defining who your learners are and understanding what will most appeal to them in the educational process will help you write content that is quickly comprehended and better retained. You might use a discussion board if your company has a lot of Activists, allowing them to determine methods, procedures or policies on their own in a community-based conversation. You may also include a course segment in written lecture format to overview specific aspects of standard policies in order to reach your Theorists or Pragmatists. By combing modes and styles of instruction, your course will more appealing to a larger number of learners. By defining a complete educational strategy, you will be better prepared to write and execute the course. 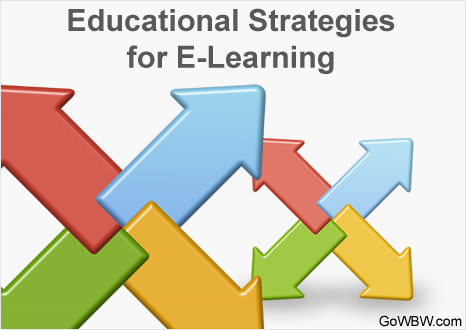 Your educational strategy may cover one, specific course or it may cover a whole series of courses designed to enrich a learner on a specific educational path. The educational strategy is simply a tool to help you stay organized and focused as you write course content.